Yellowjackets nest in the tree in front of my house. The big nest was suddenly there one morning. My next door neighbor called before 8 a.m. asking if I saw the big nest in the tree that grew in front of our houses. I hadn’t noticed it. We used my binoculars to marvel at the engineering skill of the big gray and tan object partially hidden by green leaves. The presence of the nest also solved a mystery that had lingered since the spring. The tree outside our house, a Bradford Pear, had housed a family of squirrels for many decades. The squirrels had two large leafy nests, nestled in forks near the top of the tree. This spring the squirrels dismantled their nests and just threw the old leaves, twine, twigs, and other materials down on the ground. We humans had to clean it up. We couldn’t figure out why the squirrels dismantled their houses and just left. We got the feeling that the squirrels were a bit ticked off for some reason. They seemed to have left in a huff. The nest is attached to a tree branch. The nest is about twenty feet above the ground in this small tree. One day when a heavy rain was in the weather forecast, my neighbors and I watched as the yellowjackets add leaves to their nest. They “glued” leaves of the tree to the top of the nest creating an overhanging roof. Our guess was the leaves help to shed rain off of the nest. Once the leaves were added, it was hard to see the nest. What Species Make These Kinds of Paper Nests? As we looked at the nests, we could see insects moving in and out of the entrance hole. Being the naturalist, my neighbors asked me to identify the insects. What species of animals made this magnificent nest? I hadn’t seen the insects up close and really didn’t want to. So, I had to guess. Insects that build nests such as the one in front of my house are wasps. In North America, these wasps are called yellowjackets. In other English-speaking countries, yellowjackets are often called wasps. If you research these insects you might see them called paper wasps (Family: Vespidae, subfamily: Polistinae) instead of yellowjackets. There are two genera of yellowjackets, Vespid and Dolichovespula. The Vespid Family of yellowjackets typically builds their nest underground. That rules this nest out. 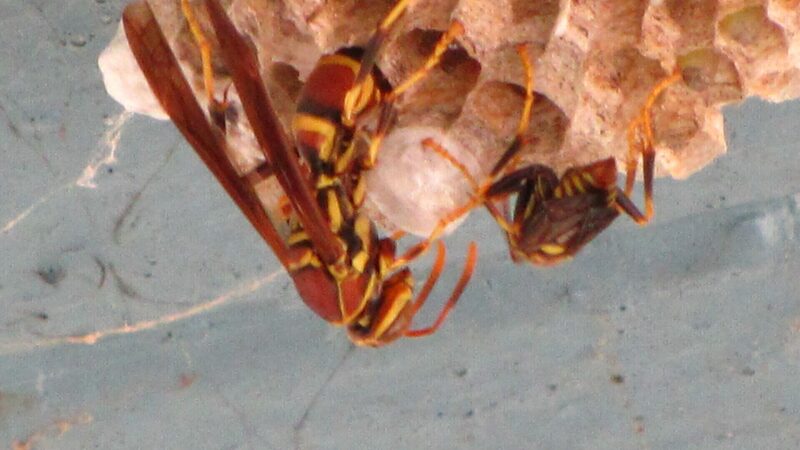 So, these yellowjackets have to be a Dolichovespula species. The Dolichovespula species typically make nests that hang in exposed places from branches or house eaves. Dolichovespula rarely makes underground nests. From the presence of the yellowjacket nest, my neighbors and I figured the squirrels saw the yellowjackets begin their nest and decided to pack it in. Yellowjackets nests look similar the nest of paper wasps. The yellowjackets surrounded their nests by an envelope of paper. The envelope gives the nest that smooth look. That opening at the bottom is an entrance. Paper wasps don’t surround their nests with an envelope. 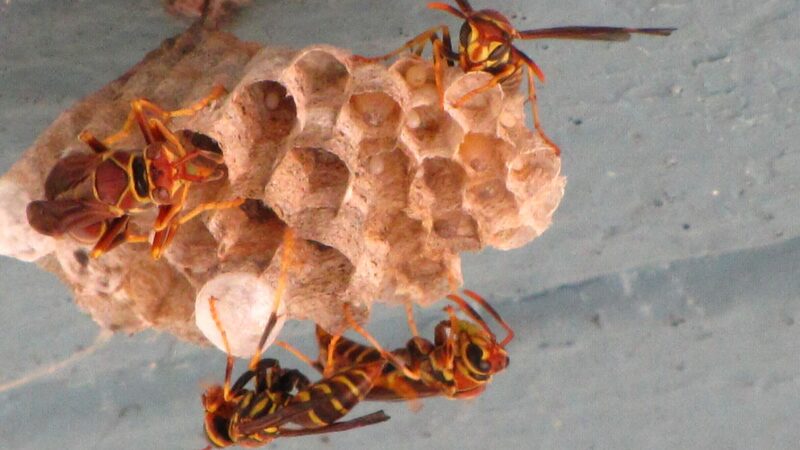 Paper wasps nests are a cluster of cells that look like a honeycomb. A paper wasp nest will look similar to the one in the photo. How Do These Yellowjacket Nests Begin? The Yellowjacket queen comes out of diapause, a form of hibernation, in the spring. She starts by making a few hexagons cells like typical wasp nests. She lays an egg in each hexagon. She covers the cells with a paper covering. The eggs develop and hatch. When the new yellowjackets mature, they will add to the nest and tend the eggs that queen has laid. The yellowjacket workers will feed the larvae chewed up insects. The insects in the nests will die as the weather grows colder. The queen will enter diapause (a type of hibernation) and overwinter. She will start a new nest next spring. In warm climates paper wasps nests can survive for several years and grow very large. the yellowjackets use weathered wood from wooden outdoor buildings, fence post, and furniture, etc. These Yellowjackets belong to the species of wasps that make colonies. The colony building wasps include yellowjackets, paper wasps, and hornets. These insects can be very aggressive and sting when their nests are disturbed. Unlike bees, after stinging, these insects keep their stingers to sting again. Bees die after stinging someone. My neighbors and I are just waiting until the yellowjackets leave. They haven’t stung anyone. Children down the street spent the summer playing under the tree. As far as the yellowjackets are concerned, we don’t bother them and they don’t bother us.